A week ago, the wispy clouds drew my attention as I walked outside to water my garden plants. With sunset soon approaching, I decided to grab the Canon EOS 7D Mark II, a tripod and a selection of lenses with the hope of catching some sunset and/or blue hour shots in downtown Savannah, GA. I specifically chose the crop sensor 7D II because a) the crop sensor lenses are smaller allowing for a wider range of focal lengths to be carried in a small backpack and b) I didn't necessarily need the benefit of the 5D III's high ISO performance for sunset imagery. My original plan was to capture a sunset behind a silhouette of the Talmadge Memorial Bridge. After heading across the Savannah River to one of my favorite locations for photographing River Street, I realized that scene I had imagined was impossible to capture from the location I had in mind. And, unfortunately, there wasn't another easily accessible location on Hutchinson Island that would provide the angle I needed (without obstructions) to capture the sun behind the bridge. If I had taken the time to research the sun's position in relation to my intended shooting location, I would have realized that my imagined shot was not possible. Regardless, I decided to regroup and see what I could do with the beautiful sunset occurring before my eyes. As the sun sank just below the horizon, the sky became striped with vibrant colors. 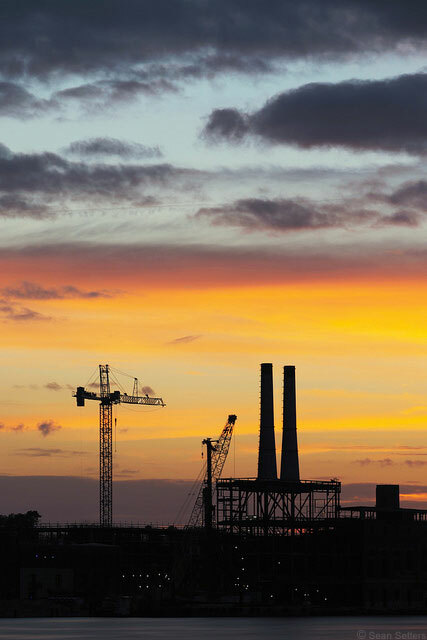 Using a couple of cranes and the stacks of a building under construction to anchor the image, I chose a verticle framing and, using the EF-S 55-250mm f/4-5.6 IS STM and the 7D II set to HDR mode, captured the dramatic skies the sunset had created. In post processing, I blurred the water in the bottom of the resulting HDR JPEG image to simulate a longer exposure, increased contrast a bit and increased saturation/vibrance to further enhance the colors in the sky. Sometimes, things work out just as you plan them; other times, they don't. Always be prepared to go with a "plan B" option, even if your backup plan is created completely on the fly. By grabbing your camera and heading out the door when conditions look favorable, you'll likely find yourself with a myriad of options to frame in your viewfinder. And don't forget, having a go-bag ready can make heading out the door that much easier. “Walking In The Air” was shot using the ultra-wide angle lens EF16-35mm f/2.8L III USM. The advanced aperture F2.8, ultra-wide angle zoom lens is popular with professionals and highly skilled enthusiasts. Enjoy the scenery of the Great Barrier Reef and Whitehaven Beach in Australia. B&H carries the Canon EF 16-35mm f/2.8L III USM (review). In this video by Kodak Moments UK, Kodak pranks unsuspecting UK residents by pretending to accidentally wipe their smart phones' data. Why? To prove how important it is to print out important images. Of course, off-site backup storage solutions offer similar (if not better) short term security for your images, but... a high quality printed image on archival paper can last for generations and can easily be enjoyed by those within close proximity. B&H carries photo printers and archival paper. Canon has released firmware updates for the EOS C700, EOS C100 Mark II, EOS C100 DAF, EOS C100, XC10, XC15, ME20F-SH, and ME200S-SH cameras. See below for details. Fixes communications with the Remote Controller RC-V100. *1 Codex Digital Recorder module. *2 When you initialize a Capture Drive with the main recording format set to [ProRes (Capture Drive)], the recordable space will be reduced to approximately half of the Capture Drive's nominal capacity to ensure a highly reliable format thanks to the use of multi-stream processing. *3 For the latest Firmware Version please check Codex Digital's website. Firmware Version 1.0.8.1.00 incorporates the following correction. The following features are enabled when these lenses are attached: CN7x17 KAS S/E1*, CN-E18-80mm T4.4 L IS KAS S or CN20x50 IAS H/E1*3. Saving and displaying metadata, such as the model name and the focal distance of the lens attached. Manual Iris control via the camera's control dial on the grip. Zoom operation via the joystick on the camera's. Operation of REC start/stop via the lens's grip unit. *The lens firmware also needs to be updated. If you have CN7x17 KAS S/E1 or CN20x50 IAS H/E1, please contact to Canon Support Center. Firmware Version 1.0.3.0 incorporates the following enhancement. Firmware Version 1.0.1.0 incorporates the following enhancement. Firmwares incorporate the following enhancements. Tv: Shutter speed is selectable. Iris, Gain and ND Filter* are set automatically. Av: Iris is selectable. Shutter speed, Gain and ND Filter* are set automatically. AGC: Shutter speed and Iris are selectable. Gain and ND Filter* are set automatically. Saving and displaying metadata, such as the model name and the focal distance of the lens when attached. Manual Iris control via the camera's joystick. Operation of REC start/stop by the separately-sold ZSG-C10. Adds three white balance modes when the camera is set to Auto: custom White Balance Set, Preset and Color temperature. Adds [59.94P(i)]* and [50.00P(i)]** output setting for Monitor terminal. When the frame rate is set to 59.94P (NTSC) or 50.00P (PAL), the 3G/HD-SDI 1 / MONITOR terminal can be set to output interlaced signal. * ND Filter can alsobe set manually. ** When using this setting 3G/HD-SDI 2 will output progressive signal. Decreased the time necessary to [Copy multiple images]. [Loop playback] functionality has been added. *1 Requires the latest version of the Connect Station App to be installed on the mobile device. *2 Proper playback is not guaranteed with movies captured with a mobile device. *3 The orientation of the Movies captured with a mobile device can be converted for playback when imported to the Connect Station CS100. *4 If the movie being imported has UTC (Universal Time Coordinated) date information, then that date information is saved after the movie is imported to the Connect Station CS100. If the footage does not have UTC date information, then the imported date will be the date information for the move file. *5 When [Auto standby] is set to [Disable], and the monitor is displayed for a prolonged period of time, screen burn-in may occur. 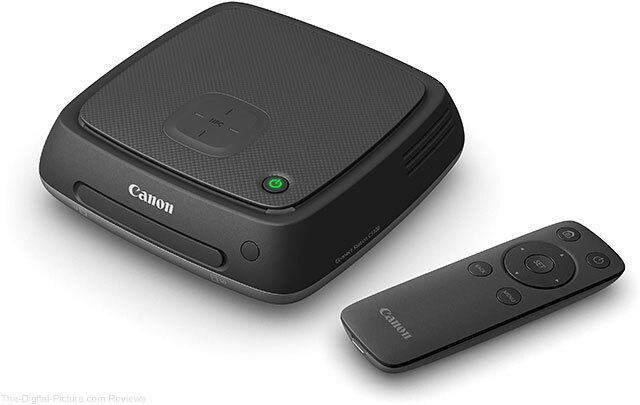 For detailed information about the functions of the Connect Station CS100, please refer to the latest instruction manual which can be found on the Canon Website. This firmware update is for Connect Station CS100 with Firmware up to Version 2.0.4. Turn on the power of the CS100, and connect the device to the Internet. *For details on how to connect the CS100 to the Internet, please see the user’s manual. Press the [Home] button on the remote control, and check whether [ ! ] appears over the “Preferences” item, and if so, select the “Preferences” item, and then press . Press the [Right] button of Cross keys on the remote control, select the tab in the image below, and after checking that [ ! ] appears next to [Update Firmware], select [Update Firmware], and then press . Press [MENU] on the remote control to start downloading and updating the firmware. Press the [Right] button of Cross keys on the remote control, select the tab in the image below, and check whether the information on the [Update Firmware] screen indicates the latest firmware version. B&H carries the Canon Connect Station CS100. 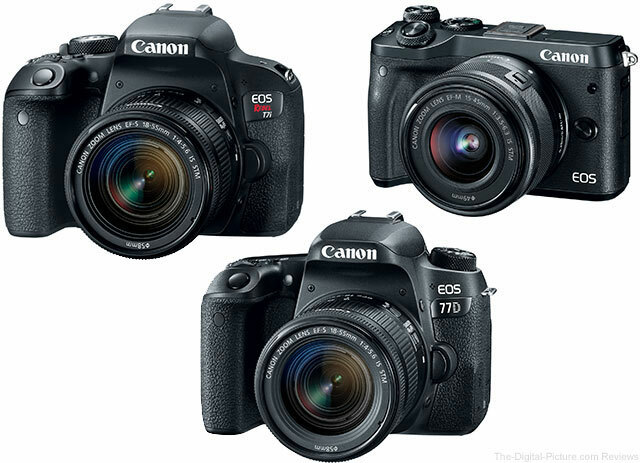 B&H has the Canon EOS M6, EOS 77D & EOS Rebel T7i cameras in stock with free expedited shipping. Note: Body-only versions of the EOS M6 and Rebel T7i are not yet in stock, but the with-lens kits are. Should I Get the Canon EOS 5D Mark IV or the EOS 6D? If stepping up from a crop sensor camera like the EOS 80D or a Rebel-series camera, there are two full frame Canon DSLRs outside of the 1-series that one might consider – the EOS 5D Mark IV and EOS 6D. Both offer a step up in high ISO image quality afforded by a larger full frame sensor, but feature gap between them is as significant as the price gap. Let's dig a little deeper to see which body might be the better option for your needs and budget. From an image quality perspective (assuming a properly in-focus subject), the two bodies perform very similarly (disregarding differences in resolution). And from that standpoint, either body can serve as a very compelling upgrade for those stepping up from a 1.6x crop sensor camera like the **D or Rebel/***D/****D series. With that in mind, let's take a look at the specific benefits of each DSLR. Slightly faster flash sync speed: 1/200 sec. vs. 1/180 sec. While it's obvious from above that the EOS 5D Mark IV is a full featured, advanced DSLR with numerous benefits over the 6D, the 5D IV's superior feature set results in a significant price differential in respect to Canon's entry-level full frame DSLR. How significant? Considering current manufacturer suggested retail pricing (without rebates), you could purchase two Canon EOS 6D DSLRs in place of a single 5D Mark IV (and still have a little money left over). It's difficult to deny that the 5D IV is a general purpose powerhouse, with the ability to cover a wide range of situations including sports (thanks to its faster frame rate & flicker avoidance), wildlife (due to the advanced AF system and cropping ability afforded by its higher resolution), architecture, portraiture, event photography and... well, just about everything else. 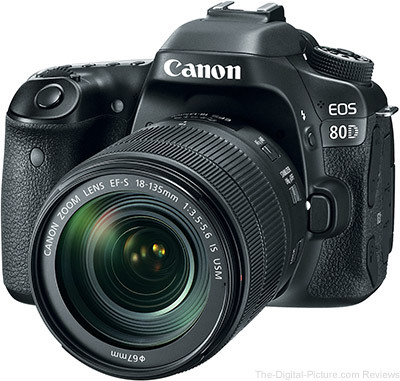 But if you're upgrading to a full frame camera for the first time, or otherwise are looking to add a backup camera to your full frame capable kit, then the EOS 6D represents an excellent value for the feature set it does have and the image quality it is capable of. Of course, the 5D IV would be an easy recommendation for many enthusiast/advanced/pro photographers. However, one's budget and primary photographic disciplines must be considered. For instance, if you're a wedding photographer, you could easily make the case for investing in two EOS 6D bodies rather than purchasing on a single EOS 5D Mark IV (we recommend always having a backup body for wedding/event photography purposes). Or, if you're a hobbyist who is uninterested in DSLR video recording and does not intend on needing/wanting the majority of the 5D IV's benefits, then the EOS 6D will ultimately be the better choice. For everyone else, there's the 5D Mark IV. Permalink: Should I Get the Canon EOS 5D Mark IV or the EOS 6D? Preorders for the Sigma 100-400mm f/5-6.3 DG OS HSM Contemporary Lens are now live. B&H is proud to present its Women of Influence series. Kirsten Johnson is a documentary filmmaker and cinematographer. After years in the the industry, she made her directorial debut with 2016's Cameraperson. 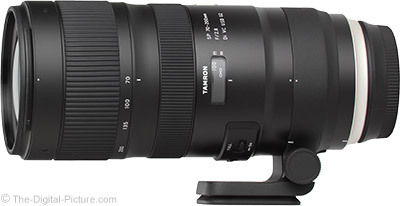 Image quality results have been added to the Tamron 70-200mm f/2.8 Di VC USD G2 Lens Review. I think that you are going to like what you see here. Check out the Tamron G2 vs. Canon IS II comparison. B&H has the Tamron 70-200mm f/2.8 Di VC USD G2 Lens in stock (Nikon mount coming very soon). According to B&H, the Sigma 100-400mm f/5-6.3 DG OS HSM Contemporary Lens will be available for preorder at midnight tonight. Pricing has yet to be published. To support this site, please check back with us at midnight to use our links for your preorder. MILPITAS, Calif., March 22, 2017 — Lexar, a leading global brand of flash memory products, today announced the Lexar JumpDrive Tough, a high-performance JumpDrive USB flash drive created to withstand life’s challenges, all while protecting the contents of your drive through an advanced security software. A fast and secure offering in the JumpDrive USB flash drive performance lineup, the JumpDrive Tough combines a rugged yet stylish look with secure, high-speed performance. This stylish, lightweight drive is impact/pressure (up to 750 PSI), weather (-13°F to 300°F), and water (up to 98 feet) resistant. The drive comes equipped with EncryptStick Lite software, an advanced security solution with 256-bit AES encryption that helps to securely protect files against corruption, loss and deletion. This tough USB 3.1 flash drive allows users to securely transfer photos, videos, and files with speeds up to 150MB/s read and 60MB/s write. * Users can quickly transfer a 3GB HD video clip in less than 1 minute, compared to the 4 minutes it takes using a standard USB 2.0 drive. ** For added versatility, the drive is also backwards compatible with USB 3.0 and 2.0 devices. 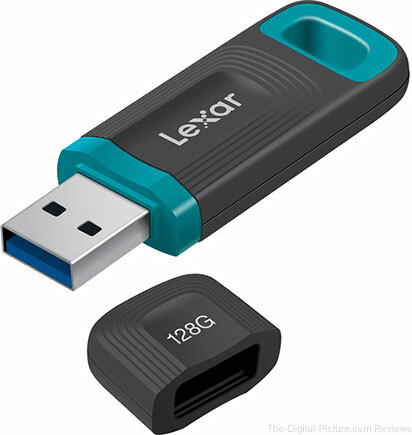 The Lexar JumpDrive Tough USB 3.1 flash drive is compatible with PC and Mac systems, backwards compatible with USB 3.0 and 2.0 devices and comes with a three-year limited warranty. Furthermore, all Lexar product designs undergo extensive testing in the Lexar Quality Labs to ensure performance, quality, compatibility, and reliability with more than 1,200 digital devices. The new Lexar JumpDrive Tough is available now at MSRPs of $19.99 (32GB), $34.99 (64GB), and $59.99 (128GB). B&H carries the Lexar JumpDrive Tough USB Flash Drives. It is early spring and, at least here in the mid-Atlantic and farther north latitudes, the outdoor landscape is looking rather bleak right now. The snow is gone and the green has not yet come. That makes this is a great time of the year to focus on indoor photography and interior architecture is one great option. And when photographing interior architecture, an ultra-wide angle lens becomes especially useful. 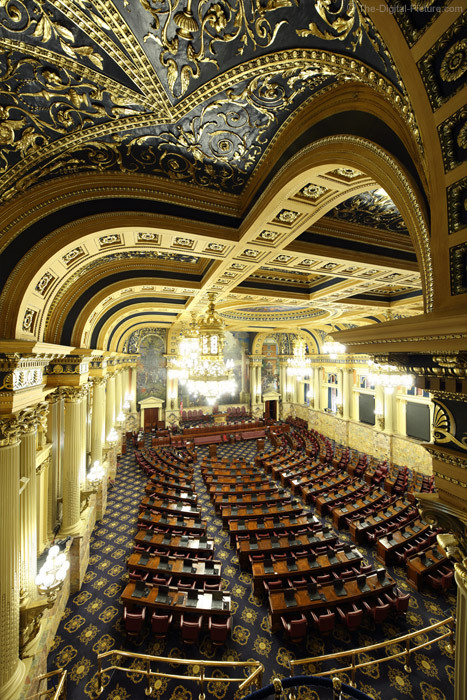 Most of us photographers love curves and the Italian architecture in the Pennsylvania House Chamber is filled with them. While cameras are not permitted in this space when the house is in session, selecting a non-session day cleared that roadblock. Moving to one side of the balcony gave me an angled view across the room that sent ceiling lines arching into the frame. Got 12mm in your kit? That is the full frame focal length you will need to capture this image and many others like it. The Sigma 12-24mm f/4 DG HSM Art Lens on a full frame body executes this image (and those similar to it) extremely well. Even though the aperture used was not extremely narrow (f/8), the entire image is within the 12mm depth of field and the Canon EOS 5Ds R's extreme resolution was fully utilized with essentially no visible impact caused by diffraction. This image is tack sharp from corner to corner. Notice that the columns on the sides of the image are vertically straight (or very close to being so)? While it is easy to have these lines angling inward or outward when using a focal length this wide (and that is sometimes a desired effect), a vertically level camera will render vertical lines parallel to each other and these lines can be parallel to the frame borders as long as the camera is horizontally leveled. Spend your money on gear, not admission fees. One of the great things about the PA state capitol building is that admission is free. While you may not live close to this specific capitol building and will not likely find it alone to be worth a plane ticket or all-day drive to get there, your own state capitol building may offer the same deal. I didn't check all 50 USA state capitol buildings (or any outside of the USA), but many others also have free admission. Get your ultra-wide angle lens and go photograph some interior architecture! The New Leica Summaron-M 28mm f/5.6 – It Costs How Much?! It's no secret that Bryan and I use Canon DSLRs and Canon-compatible lenses in our daily lives. Bryan has much more experience with non-Canon camera systems than I do (though I have some), but neither of us has any experience with Leica cameras and lenses. Regardless, we enjoy reading about all types of camera gear when they are introduced. Keeping abreast of the camera industry as a whole allows us to better understand Canon's (and Nikon's / Sony's) position in the marketplace. As such, I recently read an article about Leica's newest M-mount prime lens, the Summaron-M 28mm f/5.6. And that got me thinking, "Why in the world would anyone buy this?" Classic symmetrical optical design uses six elements in four groups to achieve a distinctly analog appearance with natural contrast, fine rendition of details and sharpness, and noticeable vignetting for an aesthetic, unique image quality. So it features an optical design from the 1950s and the vignetting is so bad that Leica is advertising it as an "aesthetic, unique image quality" feature. Nice marketing. They were probably wise to skip over the part about the lens having an agonizingly narrow aperture for a prime. But negatives aside, I do understand the benefits of having a pancake-style lens that's very easy to carry. There's definitely some value in that particular aspect of the lens. But how much is that value worth to someone who owns, let's say, a Leica M Digital Rangefinder? This is the part where my jaw drops and my head starts hurting. Even I get nostalgic at times, and I can see why someone would enjoy using Leica cameras (even film cameras) for that reason. But for the life of me, I can't figure out why anyone would spend $2,500.00 for a moderately wide angle f/5.6 prime lens with an optical design straight out of 1955. What do you think of the Summaron-M 28mm f/5.6? Let us know in the comments. 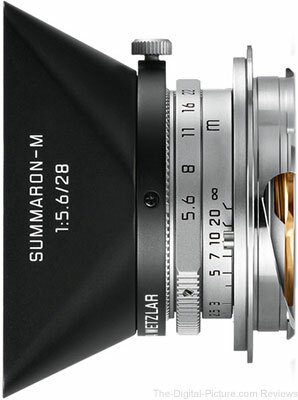 Permalink: The New Leica Summaron-M 28mm f/5.6 – It Costs How Much? !